clear stamps | Stamp Right Up! I have finally moved, unpacked and organized (sort of) my craft area. YAY! 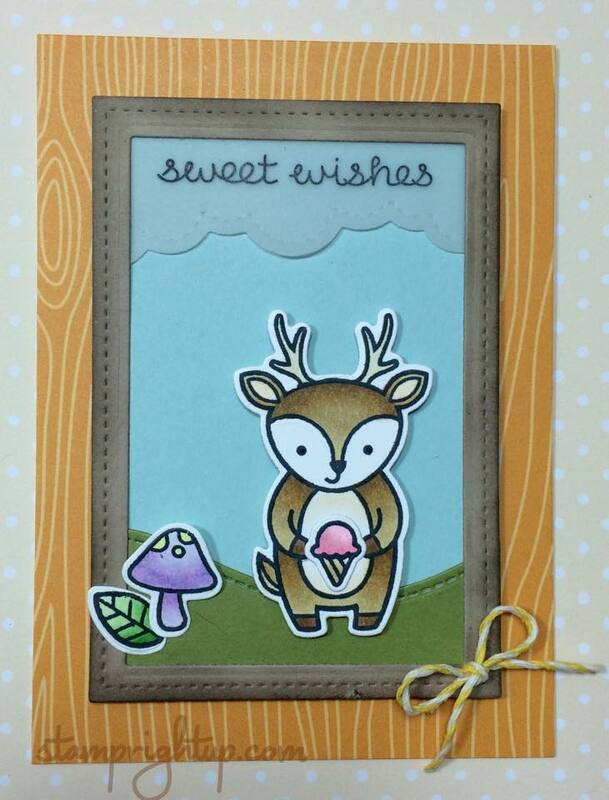 So I set about to use one of my new Lawn Fawn stamps ~ Party Animals! Using the Butternut 4bar note card, I used the stitched rectangle dies, along with the puffy clouds, and stitched hillsides to make the scene for my little deer (moose?) critter. He looked a little lonely, so I thought a tiny mushroom from the Gleeful Gardens stamp set would work great, along with a leaf from Critters From The Past. The sentiment was from Milk & Cookies; I thought it was perfect for this layout.